Alleve Animal Hospital: Complete veterinary services for your four-legged family members. Any clients willing to share their experience at Alleve are encouraged to e-mail their story along with a picture with his/her pet(s) to allevevet@gmail.com. 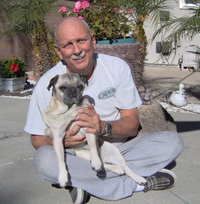 "Dr. Boparai is wonderful, professional, and has a great concern for all pets. I always feel like he and Emily & Jessica treat my pug Player like he his part of their family. I like to call Dr. Boparai "God parent" because I know I never have to worry when I need to visit for medical treatment. He answers any questions in full detail. The staff always make time for players needs. I have a great peace of mind when I bring Player to see Dr. Boparai because I know he will get the most technically advanced treatment that veterinary medicine has to offer." I would like to share my experiences with Alleve Animal Hospital, Dr. Boparai and his staff. I took Libby, my Rhodesian Ridgeback puppy to Alleve in the beginning of May, 2011. She was just a couple of months old and weighed 17.8lbs. She received all of her puppy vaccinations and was spayed there. During her last visit, in the middle of August, she was 73.5 pounds, healthy, energetic and happy. From the first visit to the last, she has been treated like a member of the family, as have I. As soon as she enters the parking lot her tail starts to wag and she gets excited because she knows she is going to the vet! Dr. B is a friendly, kind, gentle and thoughtful man who treats Libby like a friend. He never starts examination or treatment until he has greeted and interacted with Libby. He is very knowledgeable and skilled and explains all treatment options in detail so that you can make an informed decision regarding treatment. He never ends the appointment until all of my questions are answered and never assumes anything. I have told him I wish he was my doctor! I have never dealt with such a sincere and considerate medical professional. I have asked his advice on many issues ranging from housebreaking to flea treatment to baths and shampoo. He always takes the time to answer them fully. The staff at Alleve is a reflection of Dr. B. They are attentive, efficient and friendly animal-lovers. They love to see Libby and she absolutely loves them all. They keep track of Libby's medical history and email me to remind me of appointments, and remind me when Libby is due for shots or other treatments. I have never had a vet staff provide this level of service. I could not be happier or more satisfied and I would recommend them to anyone. "We would like to thank Dr. Boparai and his caring staff for taking such good care of our dog Sierra. Not only are they very thoughtful for her not feeling well but the Dr. was very helpful in explaining how the test results and symptoms were related. He explained to us what we needed to do to help Sierra get better. Sierra was very comortable and at ease with Dr. Boparai which makes us feel good. Thank you, Geoff,Julie, and Sierra." "Dr. Boparai is the absolute best veterinarian imaginable. He has so much love and compassion for animals. I know my Beo and Heidi (GSDs) are always in perfect health because of his expert medical attention and his deep caring for my dogs." Open Monday – Friday 8:00 a.m. – 7:00 p.m. Saturday 9:00 a.m. – 4:00 p.m.